21 new jobs for the hospital; which includes one nurse practitioner job, three nursing positions and two administrative positions. 5000 square foot renovation to oncology department that doubles the number of treatment spaces from 7 to 14 and physician exam rooms from 2 to 4. Expansion of emergency room from 7 bed unit to 12 to accommodate 18,000 visits per year. 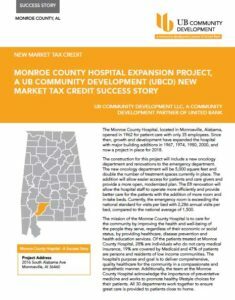 Monroe County Hospital serves Monroe County in rural blackbelt Alabama. The loss of this facility would have resulted in residents having to drive over 50 miles for emergency medical care and over 90 miles for oncology services. This hospital reaches patients who otherwise would not have readily available access to health care due to the distance either to Mobile or Montgomery. 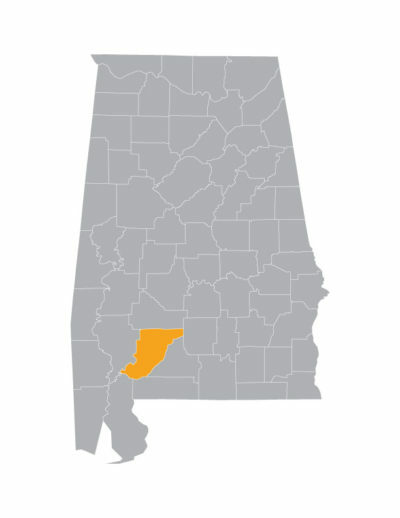 The Monroe County Hospital, located in Monroeville, Alabama, opened in 1962 for patient care with only 35 employees. Since then, growth and development have expanded the hospital with major building additions in 1967, 1974, 1980, 2000, and now a project in place for 2018. The construction for this project will include a new oncology department and renovations to the emergency department. The new oncology department will be 5,000 square feet and double the number of treatment spaces currently in place. The addition will allow easier access for patients and care givers and provide a more open, modernized plan. The ER renovation will allow the hospital staff to operate more efficiently and provide better care for the patients with the addition of more room and in-take beds. Currently, the emergency room is exceeding the national standard for visits per bed with 2,286 annual visits per bed, compared to the national average of 1,500. The mission of the Monroe County Hospital is to care for the community by improving the health and well-being of the people they serve, regardless of their economic or social status, by providing healthcare, disease prevention and health education services. Of the patients treated at Monroe County Hospital, 28% are individuals who do not carry medical insurance, 19% are covered by Medicaid and 47% of patients are persons and residents of low income communities. The hospital’s purpose and goal is to deliver comprehensive, quality healthcare for the community in a compassionate and empathetic manner. Additionally, the team at the Monroe County Hospital acknowledge the importance of preventative medicine and works to promote healthy lifestyle choices for their patients. All 30 departments work together to ensure great care is provided to patients close to home. UBCD assisted in structure of financing and coordination of the tax credit transaction for this project. Other entities involved in the Monroe County Hospital project include The National Community Investment Fund serving as the tax credit provider and Wells Fargo as the tax credit investor.